If you have been watching Michael Portillo travelling on the trains in Alaska recently, you will have gathered how diverse and wonderful a State (country almost) it is. It truly is a destination in its own right and adding a cruise up the Inner Passage ensures a holiday full of contrast. Without a doubt, a good display of Aurora Borealis is one of the most magical sights ever. The eerie lights in the northern skies float and dance rather like a voile curtain on a summer breeze. Without a doubt, a good display of Aurora Borealis is one of the most magical sights ever. The eerie lights in the northern skies float and dance rather like a voile curtain on a summer breeze. Sound romantic? It is and once seen, never forgotten. The following idea is a short itinerary aimed at getting you to the right place to have a good chance of seeing this natural phenomena – but if you have a little more time available, consider extending the holiday by a few days. Fly from London Heathrow to Seattle. Whilst it is possible to continue your journey to Alaska today, we suggest an overnight break in Seattle. Seattle is a delightful city in its own right and a couple of nights here either at the beginning or end of your holidaywould be well worth considering. Fly from Seattle to Fairbanks. Fairbanks is the second largest city in Alaska and is the gateway to Alaska’s Arctic. The city has a long and colourful history dating back to the late 1800’s and discovery of gold. There is an opportunity here to add in a couple of nights at Chena Hot Springs – these hot springs are well developed and visitors can enjoy the hot springs in hot pools and swimming pools. Fly north, into Alaska’s Arctic, above the Arctic Circle to rustic Coldfoot. Arrive in time to enjoy lunch at the Trucker’s Café and get settled into your overnight accommodation. Choose to join an optional aurora viewing expedition to nearby Wiseman. Coldfoot was originally names Slate Creek and was founded around 1898 when thousands of stampeders came to the area in search of gold. At this time, Coldfoot was a well established town. Today, Coldfoot consists of a few buildings and services and provides a welcome break for the Dalton Highway traveller. Select from a variety of optional tours which include an excursion along the Dalton Highway into the Brooks Mountain Range, as far north as Atigun Pass (weather permitting); a two-hour dog sledding experience with a local musher and additional aurora viewing in Wiseman. Arctic Mountain Safari: Enjoy an afternoon exploring the Brooks Mountain range on a drive north from Coldfoot on the Dalton Highway as far north as Atigun Pass (weather permitting). Arctic Village Aurora: Enjoy an evening tour to historic Wiseman for a unique cabin visit and an opportunity to enjoy the solitude of the Brooks Mountain Range as you scan the northern sky for Northern Lights. Dog Sledding Adventures: Enjoy an experience with real Alaskan sled dogs. Learn what it takes to have a dog team in Alaska and enjoy a 30 minute ride. Return to Fairbanks on a guided ground tour in the personalized comfort of a tour vans. Appreciate the low light on the horizon as it shines on the windswept arctic tundra. Cross the Arctic Circle in ceremonious fashion and receive an official Arctic Circle Adventure Certificate. Traverse the frozen Yukon River and enjoy the snow-sculpted forest as you make your way back into Fairbanks. One of the most delightful and leisurely ways to travel anywhere in the world is by rail, and Alaska is no exception. In the winter months, the Alaska Railroad offers a limited service on this popular route. The train leave Fairbanks at 08.30, arriving into Anchorage almost 12 hours later. For the winter sports enthusiast, the ski slopes of Alyeska are not far away, and a few days downhill skiing could easily be added here. Whilst the skiing is not extensive, some of it is challenging, with some good runs for all grades of skier. On the first weekend of March every year, Main Street, Anchorage is transformed into a snowy trail, awaiting the ceremonial start of the annual Iditarod Sled Dog Race. This 1100 mile race across the icy wastes of interior Alaska is the ultimate test of man and beast and without the aid of satellite navigation, teams of one man and 16 dogs set off towards Nome on the Iditarod Trail. This is an extraordinary site and you could be there! A truly beautiful route through Alaska. Explore Alaska’s stunning landscapes – rugged mountains, alpine meadows, crystal lakes, glaciers, diverse and abundant wildlife. Arrive in Anchorage, Alaska’s largest city; at least 2 nights here to relax after your flights and explore the city. Hire a bike and cycle along the coastal trail; with views of Cook Inlet and six mountain ranges, the odd moose is often spotted along the way. Find out about Alaska’s indigenous people at the wonderful Alaska Native Heritage Centre. Pick up your hire car and drive the short distance into the wild and beautiful Mat-Su Valley. Spend at least 2 nights in the spectacular wilderness setting of Knik River Lodge. Glacier treks, dog sledding, air boat and helicopter tours of the magnificent Knik Glacier are on offer here. Continue up the Parks Highway. For unsurpassed views of Mt Mckinley, a night (or two) at Talkeetna is highly recommended. From here take a spectacular flight seeing tour or enjoy a jet-boat wilderness adventure along the river. Along the way look out for bald eagles, beavers or moose then visit a replicated native Alaskan encampment to learn about the indigenous culture. Spend a couple of days in Denali; if possible, get out to the Back Country Lodges for a true wilderness experience. Or stay near the entrance and take a full day guided tour into the park. Sweeping landscapes and incredible wildlife including bears, wolves, caribou and moose are often spotted. Continue on to Fairbanks, the gateway to the Arctic. For a great insight into the Aurora Borealis, visit the museum at the University of Alaska. If budget allows, consider taking a day trip by air and road to Coldfoot in the Arctic Circle – a chance to experience the Tundra. You might also consider either a day trip, or possibly an overnight stay at Chena Hot Springs. Drive the scenic Richardson Highway from Fairbanks to Valdez. Two nights here with the opportunity to take a cruise into Prince William Sound by ship or sea Kayak. Relaxing cruise on the Alaska Marine Highway from Valdez to Whittier, then drive to Seward on the Kenai Peninsular for a two night stay. Seward is located on the beautiful Resurrection Bay, backed by abrupt mountain slopes often topped with snow. The town is gateway to the Kenai Fjords National Park, one of Alaska’s treasures with abundant wildlife and spectacular glacial scenery. Marine wildlife thrives in the Fjords – sightings of orca and humpback whales, sea otters and sea birds are common. Then on to Homer on the western side of the Kenai Peninsula for a two night stay. Homer has a picturesque setting, mild climate and great halibut fishing. It is also home to a large artist community, with handcrafted art available in the local shops and galleries. Across the water from Homer is Hallo Bay, an excellent place from which to see brown bears in the wild. If your time and budget allows, there is a day trip by light aircraft that takes you over, with an expert guide. Back to Anchorage along the Cook Inlet (Turnagain Arm) – pods of Beluga Whales are often spotted here. A stop off for coffee at Mount Alyeska, Alaska’s premier ski resort, is well worthwhile – a trip up on the lift offers wonderful views on a clear day. Travel this region just south of Anchorage on this itinerary. Welcome to the Kenai Peninsula, in the south central region located just south of Anchorage and known as Alaska’s Playground. This short itinerary is suitable as an add on to your Winter Northern Lights experience. Fly to Anchorage, pick up a car on arrival and stay 2 nights in the State’s largest city. Drive south for about 40 miles to the small mountain community of Girdwood – home to the biggest downhill ski resort in Alaska – for an overnight stay at the Alyeska Resort. Your next destination is the seaside village of Seward – one of Alaska’s oldest and most scenic communities, located on beautiful Resurrection Bay – for a two night stay. 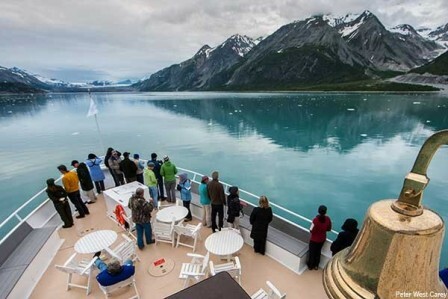 Depending on your arrival time in Seward, you might like to join a 2½-hr winter glacier and wildlife cruise of Resurrection Bay. Enjoy a hot lunch while watching for marine wildlife, such as Steller sea lions, sea otters, mountain goats, bald eagles and even possibly a whale. You will also see Bear Glacier, a massive river of ice flowing from Harding Ice Field located in Kenai Fjords National Park. Free passes to the Alaska Wildlife Conservation Centre are included – so you can see moose, bears, musk oxen, and other local wildlife up close. Today’s drive takes you over to the Kenai Peninsula, where the Kenai River meets the Cook Inlet for a 2-night stay in Soldotna, the central hub of the Kenai Peninsula. The lakes near Soldotna provide excellent ice fishing and Cook Inlet is known for excellent winter king salmon fishing. Clamming is also still an option on milder days. Dog sled tours and rides and hockey/ice-skating are also local attractions. In nearby Sterling, visit Iditarod musher Mitch Seavey’s winter kennel for a kennel tour and dog sled ride. Alaska, whilst part of the USA, is a unique destination, with a mind and feel of its own. Towering cliffs of glacial ice, tens of thousands of years old, snow-capped mountains, thickly forested slopes and deep fjords, make this a distinctly different experience. Many areas provide havens for wildlife – bald eagles, Humpback, Beluga or Orca whales and seals are frequently spotted together with bears and other land and water based creatures. Re-discover the Goldrush era, or simply marvel at the determination of the hardy souls that first settled this wondrous land. Whatever your choice of travel whatever the boundaries of your comfort zone, call our experts for advice and guidance. In this self-drive itinerary we introduce you to the fascinating land that is Canada’s Yukon before dipping into Alaska’s south-west corner. Fly to Vancouver, British Columbia for an overnight stay to explore the many attractions of this vibrant city. Fly to Yukon’s capital, Whitehorse. Explore the many attractions including great museums, fine dining, a hot springs and great shopping. Visit the S.S Klondike, the largest sternwheeler to ply the Yukon River and a Parks Canada National Historic Site. Take a trip to the Yukon Wildlife Preserve to watch and photograph the wildlife in their natural preserve – including woodland caribou, moose, elk and Dall’s sheep amongst others. Collect your hire car this morning and drive to Dawson City, a vibrant mining, cultural and tourism centre, and the home of the Klondike Gold Rush of 1898, and today a National Historic Site. Explore the Klondike goldfields to get a taste of the gold fever that gripped North America a century ago, pan for gold on Bonanza Creek – where the gold was originally discovered back in 1896 – at the free claim owned by the Klondike Visitors Association. And – if you’re feeling lucky – visit Diamond Tooth Gertie’s Gambling Hall and try your luck at roulette or blackjack. A full day’s drive today – a free ferry takes you across the Yukon River to the winding, scenic ‘Top of the World’ Highway. This ridge-top road crosses into Alaska and joins the Taylor Highway before joining up with the Alaska Highway at Tetlin Junction. Leave Beaver Creek today, crossing the White River – named after the milky sediments it carries – past the Kluane Wilderness Village and Burwash Landing – a small first Nation Community on the shores of the Kluane Lake. Travel down into Alaska today to your next destination – Haines – situated at the northern end of America’s longest fjord, sharing a border with 20 million acres of protected wilderness. Haines is a picturesque fishing village located on a finger of land between the Chilkat and Chilkoot inlets on the Lynn Canal. Travel on the Alaska Marine Highway today for the 1-hour journey to Skagway. This is the State run ferry service that provides a much needed link with the outside world to many communities otherwise cut off the rest of the world. Your journey takes you back into the Yukon today – crossing the Teslin River on route to your next stop at Johnson’s Crossing, in the Southern Lakes region. Today’s drive will take you back to the capital city. For hen lovers, the long drive between Dawson City and Beaver Creek (nearly 9 hours) may be a step too far, however, you could break the journey at Chicken, Alaska, population in single digits and limited accommodation – but would be great to get the t-shirt!! This itinerary is just one idea for exploring some of the most incredible places in Alaska: it covers several of the main places of interest and is intended to offer an insight into the numerous possibilities. The itinerary is just one idea for exploring some of the most incredible places in Alaska: it covers several of the main places of interest and is intended to offer an insight into the numerous possibilities. Flights are used to connect the various towns; there are few roads, particularly in the South East. Alternatively you may use the State run ferry service, the Alaska Marine Highway, to travel between the towns. This ferry system provides a much needed link with the outside world for the many communities dotted along the stunning coastline. The ferry visits numerous little ports not served by the bigger cruise ships. Hundreds of small islands are waiting to be discovered by the slightly more intrepid traveller. There are daily flights into Gustavus from Seattle via Juneau. From Gustavus you have access to the spectacular Glacier Bay National Park. Thirteen glaciers flow from surrounding mountains into the waters of Glacier Bay and a day’s cruise around the bay is a must. Other tours include sea-kayaking, whale-watching and fishing. Short flight to Skagway where the history of the 1898 Klondike Gold Rush is evident. See the famous Red Onion Saloon and the Alaska Brotherhood Hall. Take a morning excursion on the famous White Pass and Yukon Railroad to White Pass Summit. Construction on the railroad commenced in May 1898 and against all odds the track was built through the rugged but beautiful terrain of the Coastal Mountains – the lure of gold! Travel by waterbus along the Lynn Canal (America’s longest fjord) to Haines. Here nature lovers will find abundant and varied bird populations, wildlife coastal rain forests and wildflower meadows. Take a half day float rafting excursion to the Chilkat Valley near Haines to see the world’s largest concentration of Bald Eagles. Grizzly and black bears and wolves can also be seen on the river banks. Short flight to Juneau, the State capital of Alaska and accessible only by air or sea. Take a trolley tour of the city, see the still active Russian Orthodox onion-domed Church, ride the Mount Roberts cable car for panoramic views of the Channel. Fly to Anchorage the commercial centre and the largest city in Alaska. Pick up your car on arrival and drive north to Denali National Park. (If you prefer not to drive travel by rail or bus up to Denali). Take a full day tour into this park where you may view bears, wolves, caribou, moose… Or take a flight seeing tour over Mount Mckinley, North America’s highest mountain.